A total of 420 tokens (coins, grain, iron, clay, wood, ..). 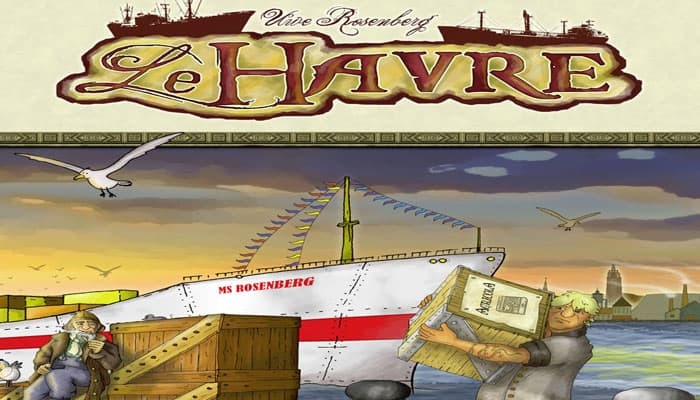 *We only recommend the 5-player game for experienced "Le Havre" players. Game boards: Place the 3 game boards beside one another in the center of the playing area. They are numbered in the top left-hand corner. 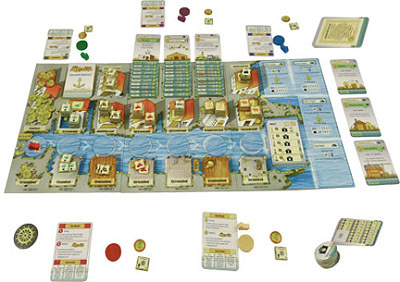 The board with the Treasury is to the left, the board with the three Building Proposals is in the center and the board with the Ship spaces is to the right. Playing pieces: Each player takes 1 Person disc, 1 Ship marker and 1 Game turn overview card in his or her color. (Players may choose to turn the Game turn overview card over to show the Buttery). Supply Tiles: Shuffle the 7 Supply tiles and place them face down on the round spaces on the game boards. Place players' Ship markers beside the first game board, near the first Supply tile. Goods and Food tokens: Place the tokens with goods and food on their Supply spaces. There is no need to place every token on these spaces; the majority can be left in the game box and added as needed. There is a Supply and a corresponding Offer space for six types of goods as well as for the 1 Franc coins, but there are only Supply spaces for the 5 Franc coins as well as for coal and hides. Francs are the currency in this game. Upgrading Goods: Each goods token has two sides: one standard side and one 'upgraded' side - these can be distinguished by their borders. Only standard goods enter the game through the Offer spaces - these can be upgraded using Building actions. Starting Offers: Before the game begins, place 2 Francs, 2 fish, 2 wood and 1 clay on the appropriate Offer spaces for the full game. (See text on the Offer spaces). Starting Money: Each player starts the full game with 5 Francs and 1 coal. Special Buildings: Shuffle the special building cards and place 6 cards face-down on the "Special buildings" space. The remaining Special building cards are not required and are returned to the box. Building cards: There are two types of building cards: Standard building cards and Special building cards (shown by the anchor). As well as an indication of how the building is used, each building card has two or three lines of symbols. Starting Buildings: The green Construction Firm card and the two Building Firm cards are removed from the pile of building cards and placed beside the game boards. These buildings were constructed before the start of the game and belong to the town. 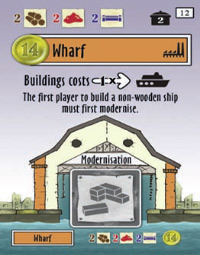 Sorting the standard buildings: The table on the back of each Standard building card shows whether the card is used in the game. The darker ticks are for the full game; the smaller, light-colored ticks are for the shortened game. Any card that does not have a tick beside the appropriate number of players is removed from the game. Exception: If a card has the text 'Start' instead of a tick, it is placed with the 3 starting buildings. Building Proposals: Shuffle the remaining standard building cards and divide them into 3 equally-sized piles. Turn each pile over and sort the cards by their Sort order number (top right) with the lowest-numbered card at the top. Fan the cards out from the Building Proposals spaces (Board 2), so that the bottom line of each card is visible. The top cards are the buildings that can be built or purchased next. Fanning the standard building cards allows players to see when which building will be available for building or purchase (and what the costs are) right from the start of the game. Round Cards: Turn the Round cards to the "Harvest" (or "No Harvest") side, sort them by Round number for the appropriate number of players, and place them face-up on the Round card space on game board 3, with the card for Round 1 on top of the pile. The table on the Round cards shows the card's Round number for different numbers of players; cards without a Round number in the appropriate row are removed from the game). Ship Cards:After each Round card has been used, turn it over. This introduces a new ship into the game. The Ship cards, which range from Wooden ships to Luxury liners, are read in the same way as the Standard building cards: the first line gives the build costs; the second shows the value (with the cost to buy shown below), the type of ship and the ship symbol. Loan Cards: Place the "Loan" cards beside the board at the start of the game. It is possible that they may never be used during the game. Round overview: In each game, only one Round overview card is used, which corresponds to the number of players. One side gives the overview for the full version and the reverse for the shortened version. Food Production Tokens: Place the Food production tokens beside the board. During the Round stage, players play a fixed number of rounds (depending on the number of players). A round consists of 7 individual player turns and, following those, the resolution of the applicable Round card. In the Final stage of the game, each player carries out one final action. Afterwards, the players count their wealth. The player with the largest fortune wins. The Starting Player is the player who lives closest to water. This player takes the Starting player tile. After his turn, players take turns in clockwise order around the table. A player's turn consists of two Mandatory actions as well as optional Additional actions. Players must carry out first a Supply action and then a Main action. Additional actions are Buying and Selling, which may be carried out at any time during the player's turn. 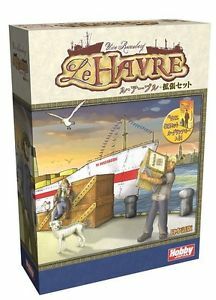 During each player's first action, new goods arrive in the harbor and are placed on the corresponding Offer space. The player taking the turn places his Ship marker on the next free Supply tile (in the direction of the arrow). In the first round, the Supply tiles are face-down until they are occupied; once they are occupied, they are turned over and remain face up until the end of the game, without changing their position. Two different tokens are shown on each Supply tile (Goods or Francs). The player takes 1 token from each of these Supply spaces and places them with the standard side up on the appropriate Offer spaces. The border on the goods token shows which is the standard side. 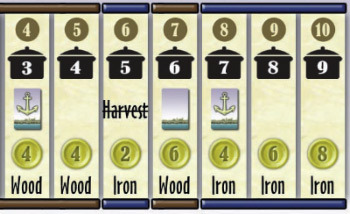 The turn in which a ship is placed on the seventh Supply tile is the last in a round. At the end of this turn, the current Round card is resolved and turned over. After this, the first turn of the following round begins with the next player's Supply action on the first Supply tile. Interest for Loan cards: The word "Interest" is written on one of the seven Supply tiles. 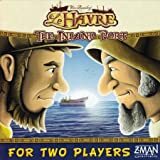 Whenever any player places a ship on this tile, all players who have taken out a loan must immediately pay exactly 1 Franc in interest, irrespective of the number of loans they have. A player who cannot pay this Franc must either sell a building or ship or take another loan card and must then pay the 1 Franc. The Main action is mandatory, and follows the Supply action. 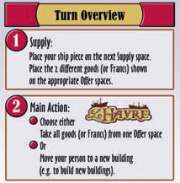 The player whose turn it is chooses one of the two Main actions: Take goods from an Offer space or Use a building action. The player takes all tokens (Goods or Francs) from one of the seven Offer spaces. There is no limit to the size of a personal supply. All goods and Francs are placed face up and may not be concealed from the other players. Entering a Building: Most of the building cards allow visitors to take an action, (e.g. to build additional buildings) or to convert standard goods to upgraded goods. To use a building's action, a player must enter the building; that is, move her Person disc to an unoccupied building. 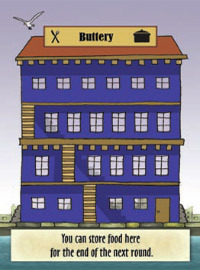 A player may enter buildings that are owned by the town or by any player. Buildings are explained on page 6 and in the Buildings overview. Entry Fee: There is often a fee to use another player's building; this is shown at the top right of the Building card (between the building costs and the Sort order number). It must be paid to the owner of the building, either in food or in Francs, before the building can be entered and used. If food and money costs are separated with a /, a player only pays one of the two costs. A player may never enter a building if she is unable to pay the entry fee. A player entering a building must carry out the building's action. Note: In this game, Food can always be replaced 1:1 with Francs. Francs can, however, never be replaced with food. In addition to the Supply and Main actions, a player can buy one or more Building and/or Ship cards at any time during his own turn (even before taking the Supply action or Main action). Buildings: At any time, all buildings that are owned by the town and the buildings on the top of the three Building Proposal piles are available for purchase. In most cases, the purchase price is the building's value; if this is not the case, the purchase price is indicated separately (as 'Cost') beneath the value. A player may buy more than one building from the same building pile in sequence. Ships: Only the topmost face-up card on each ship pile may be purchased. The cost of each ship is higher than its value and - as on the building cards - is indicated below the value. Note: Ships can be purchased even if no-one has built a wharf yet: wharves are only required to build ships. Buildings and Ships may also be sold to the town. These actions may even be taken during another player's turn, but not while she is taking an action. Buildings and ships are sold for half of their value. When a player sells a building, it is placed with the other buildings that belong to the town. When a player sells a ship, it is placed on top of the pile of Ship cards of that type. Person discs on buildings are always returned to the player when the building is bought or sold. (The people are sent home). Buildings may not be sold and then bought again in the same game turn. Buildings and ships may not be sold to other players. New buildings can be built using the "Construction Firm" and the two "Building Firms". At the start of the game, these buildings are owned by the town. A player who enters one of these buildings can build any of the top buildings in the Building Proposals area by paying the building costs of the new building. The required building materials are shown at the top of the building card (and are repeated at the bottom of the card as well). Note: Brick can always be used instead of clay and steel can always be used instead of iron. Further explanations of the building cards are included in the Buildings overview, which contains a full listing of all building cards. Ships reduce the amount of food that their owner must pay at the end of each round. At the end of each round, when the Round card is turned over, a new Ship card is introduced into the game. These ships may be built at one of the Wharves (one ship per visit). 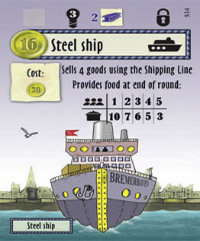 To build a Ship, a player pays any required entry fee to the owner of the Wharf and then pays the building resources and 3 energy that are required to build the ship (see Ships on the reverse side of the Round cards). Players generate energy from wood (which may be upgraded to charcoal) or coal (coke). Special Case: The first player to build a non-Wooden ship at a particular Wharf (an Iron or Steel ship or a Luxury liner) must modernize the Wharf by placing 1 brick on it. The brick remains on the Wharf for the remainder of the game to show that the Wharf has been modernized for all players. Only a player who is building a ship may modernize a Wharf. A player need not own a Wharf to modernize it. Ships are very important! In this game, long-term planning to meet food requirements is immensely important. A player who does not take much grain or cattle at the start of the game should build or even buy a ship early in the game - otherwise, it is possible that she will spend much of the game just trying to get food. In the long term, building ships is important for every player. The game essentially cannot be won without ships. In the Harvest, players receive grain and cattle. A player with at least 1 grain receives 1 additional grain. A player with at least 2 cattle receives 1 additional cattle. In rounds where "no Harvest" is shown, neither grain nor cattle is distributed. Each player must pay the amount of food shown on the Cooking pot symbol on the Round card. 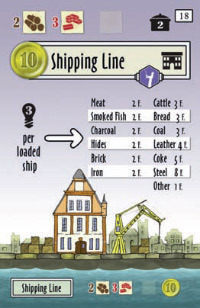 Ships help with this requirement: Each ship that a player owns reduces the amount of food that he must pay by the amount shown in the table on the ship card. A player who does not have enough food must choose either to sell buildings or to take a Loan card (or cards). Remember: Each Franc counts as 1 Food. Players can pay all or part of their food requirement in Francs. When players build ships, they receive Food production tokens that indicate the amount of food they receive each round from their Ship cards. Even if a player's ships provide more food than must be paid, or if a player cannot pay the right amount of food (e.g. by paying with a "meat" token), she may not take the excess food. The and symbols on some Round cards indicate that a building or special building card must be added to the town's buildings. Standard building card: If a normal building is required, take the card with the lowest sort order number (top right corner) from the Building Proposals. Special building card: If a Special building card is required, the top card from the face-down Special buildings pile is turned face up. Finally, the Round card is turned over to show the ship on its reverse. Place it on the pile of Ship cards of that type (see Game Board 3). The next player in turn begins the next round. The Round Overview card gives an overview of all the Round cards. The first row on the card shows the Round number in a brown circle. The second number - below the Round number and in a cooking pot - shows the amount of food that each player must consume at the end of the round. The third line indicates whether a Standard or Special building is to be built at the end of the round, or whether the Harvest does not occur. 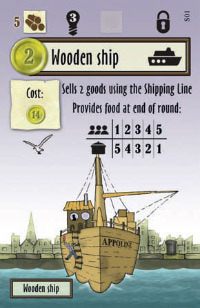 The fourth and fifth lines show which Ship card will be introduced to the game when the Round card is turned over: for example, "2" and "Wood" means a Wooden ship with a value of 2 Francs. The Round stage ends when the last Round card is resolved. The Final stage begins. Each player has exactly one more turn and carries out a Final action - a Main action (see page 5). Supply and Buying actions may not be taken, and Interest is no longer paid. Players may still repay loans and sell buildings and ships. The Starting player begins, then each other player takes a turn. Note: In the Final stage only, Person discs may be moved to buildings which are already occupied by one or more other Person discs. Each player, therefore, has the chance to visit one building of his choice during the Final action. The only building that may not be entered is the one that the Person disc is already on. The game ends immediately after the final actions. The richest player is the winner. Deduct 7 Francs for each loan that has not been repaid. Goods in a player's supply have no value (exception: the Storehouse). If there is a tie, there are several winners.